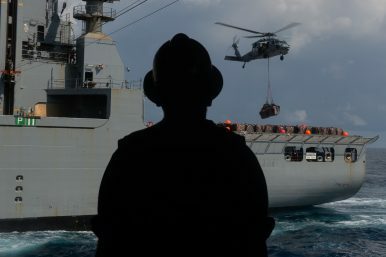 A Sailor observes an MH-60S Knight Hawk, with Helicopter Sea Combat Squadron (HSC) 14, transfer pallets of cargo from the dry cargo and ammunition ship USNS Cesar Chavez (T-AKE 14) to the Nimitz-class aircraft carrier USS John C. Stennis (CVN 74) during a replenishment-at-sea. John C. Stennis is underway conducting routine operations in the U.S. Pacific Fleet area of operations. With word that the United States is deploying the USS John C. Stennis supercarrier and its escorts to the Persian Gulf, concerns are rising as to what exactly the U.S. is doing with its Iran policy. According to Secretary of State Mike Pompeo, “[W]e are accumulating risk of escalation in the region if we fail to restore deterrence.” The deployment comes in response to an Iranian medium-range missile test, which the United States, France, and the UK have warned may violate UN obligations. Showing force will undoubtedly increase the odds of military action in case Iran ignores calls to cease missile tests or other activity. But few are wondering aloud what the rising odds of conflict mean for Afghanistan and its northern neighbor Uzbekistan. NATO and Afghan security forces are charitably described as having achieved a stalemate with the Taliban on the battlefield. Lieutenant General Kenneth McKenzie has publicly stated that Afghan security forces cannot sustain the current level of casualties, citing a need for greater support from the U.S. and NATO partners. As things have worsened in Afghanistan, the United States has stepped up its outreach to Uzbekistan. This dynamic has elevated Tashkent’s regional influence while undermining regional integration. If conflict were to break out between the U.S. and Iran, Afghanistan’s already tenuous security situation would most likely worsen as Iran reacts to U.S. pressure by more openly funneling weapons and material aid to the Taliban. Tashkent would lose a chance to deepen Iran’s engagement with Central Asia, but become all the more important to the United States in order to stabilize Afghanistan. Per remarks made by President Ashraf Ghani, Afghanistan is losing an average of 175 police and soldiers per week. The rising loss of life has been driven by Taliban and Afghan offensives back and forth all year. As of January, the BBC found that the Taliban were active in 70 percent of Afghanistan. With that kind of reach, a “stalemate” with the Taliban is a losing proposition for the United States and its NATO partners seeking to stabilize the country. As of early November, the U.S. Special Inspector General for Afghan Reconstruction (SIGAR) found that the government only controls or influences 55.5 percent of the country’s districts. The rising violence and government’s deteriorating hold on the country parallel efforts by the United States to broker peace talks between the Taliban and the government in Kabul. The trouble is that the Taliban have regained strategic momentum to negotiate from a position of strength, and have little reason to compromise unless there’s a significant change in U.S. strategy. Despite signaling interest in peace talks, there’s little reason to believe the United States is preparing to withdraw. The rhetoric of Afghanistan becoming a haven for future terrorist attacks is alive and well, and attempts to increase the pressure on the Taliban by expanding air operations are doomed to fail as a counterinsurgency strategy without a larger ground presence and more resources devoted to development. Willingness to backchannel with the Taliban has not altered the tactical and strategic stalemate the United States and its coalition partners face. Attempts to pressure Pakistan by denying aid in exchange for the cessation of aid and support for the Taliban, particularly the Haqqani Network, have failed because Washington has not shifted Pakistan’s strategic priority: preventing a strong, pro-India state from emerging in Afghanistan. Similarly, the absence of Iran from any multilateral attempts to create the conditions necessary for peace has given Washington few options. Some feared the death of Uzbek President Islam Karimov at the beginning of September 2016 was a blow for the United States in the region. Under Karimov, Uzbekistan had remained fairly independent in its policymaking, avoiding an overreliance on any external player and limiting its engagement with regional multilateral organizations led by Russia and China. Shavkat Mirziyoyev emerged as Uzbekistan’s acting president, formally securing his position by winning a managed election in December. Governing mandate in hand, Mirziyoyev sought to chart a foreign policy course responding to the shifting balance of power in Central Asia. The rise of China as a leading source of FDI and trade could best be managed by using it as a bargaining chip with both Russia and the United States, particularly since Kazakhstan has disproportionately benefited from Chinese FDI due to its geographic location and oil and gas resources. Afghanistan was the perfect means to attract attention from Washington. Mirziyoyev dispatched Foreign Minister Abdulaziz Kamilov to visit Kabul in January 2017, the first such visit by a high-placed state official in nearly 20 years. Kamilov signed a new provisional roadmap agreement to deepen economic trade and ties between the two neighbors, aiming to reach $1.5 billion in annual mutual trade turnover. The shift in economic rhetoric and attempts to proactively work with Kabul on regional trade integration expanded to bilateral security talks by July. This was all capped off when Mirziyoyev met with Ghani in Kabul in December and promoted the expansion of rail links from Mazar-i-Sharif to Herat in particular. When Ghani called for unconditional peace talks with the Taliban at the end of February this year, Mirziyoyev offered to host peace talks in Tashkent in the wake of an international peace conference held there with visible U.S. participation in late March. As the United States narrowed its opportunities for cooperation with Afghanistan’s neighbors, Uzbekistan positioned itself as a broker with an economic stake in peace. Mirziyoyev was hosted in the White House in Washington, D.C., in May, an evident sign that his gamble paid off. Apart from announcing $5 billion worth of deals – it’s always difficult to untangle what’s simply an agreement of shared interest as opposed to a real commitment to invest – security dominated the agenda. The security focus became more apparent this July when a U.S. delegation toured the five Central Asian republics for bilateral and multilateral talks in the C5+1 format. After talking economic matters in Astana, the Security Working Group met in Tashkent. Principal Deputy Assistant Secretary for Economic and Business Affairs Brian McFeeters visited in September, ostensibly to talk about business deals and the investment climate. But given McFeeters’ role spearheading outreach to countries like Azerbaijan as well, odds are good that the business deals discussed were, in fact, specific contracts pertaining to security cooperation. Further, U.S. sanctions on Russian arms manufacturers provide considerable scope. It’s likely that U.S. officials who’ve been steadily visiting Tashkent since May have made use of them in negotiating for a larger Uzbek role in securing Afghanistan. The trouble for Washington is that an escalation of sanctions on Iran and, now, coercive pressure by a show of force work against Uzbekistan’s regional interests and the stability of Afghanistan. Tashkent has looked to increase oil imports from Iran, thus decreasing its reliance on Russia and Kazakhstan. The oil could be routed by rail through Turkmenistan, or else through Afghanistan should the corridor between the Iranian border and Mazar-i-Sharif be completed. Uzbek officials have been party to longer running talks with Iranian counterparts over imports of oil via swap schemes run out of the Caspian port of Neka as well as potential investments into petrochemical projects in Iran. The deputy chairman of Uzbekistan Railways has flagged linking to the Iranian port of Chabahar – long a mainstay of chatter about India’s attempts to expand its economic and political presence in Central Asia – as crucial for trade. There’s growing interest in expanding trilateral cooperation between Uzbekistan, Afghanistan, and Iran just as Afghanistan has launched trilateral meetings with Iran and India regarding Chabahar. Though Chabahar port itself has been exempted from U.S. sanctions, its benefits are limited without achieving stability in Afghanistan. Iran could have been brought into a multilateral framework to achieve that end, but that opportunity has been wasted. U.S. policy has, therefore, limited Tashkent’s options. Uzbekistan is actively courting investment from India into industrial projects, but these ties cannot develop too deeply without better physical connectivity to ports on the Indian Ocean. Since Karimov’s death, Mirziyoyev has done his best to hedge against China’s economic clout, reportedly reaching investment deals worth $12 billion and trade deals worth $3.8 billion in April of last year. More deals have followed. Without a reliable route south, Russia has benefited most economically among the external powers jockeying after Karimov’s death. And just as the United States has begun offering Uzbekistan arms and money to encourage it to engage in Afghanistan and better police its own borders, poverty rates, food insecurity, and unemployment in Afghanistan have all increased. The escalation of sanctions has forced over 700,000 undocumented Afghan laborers working in Iran to return as violence and Taliban influence over territory has increased. U.S. policy is therefore contributing to the further destabilization of Afghanistan and forcing Uzbekistan to take a more proactive role to provide for its own security. By deploying a carrier group to the Gulf, the United States has significantly increased the odds of military action. The deployment is, by its nature, a provocation linked to a series of escalatory steps that have promoted internal fights between more dovish and hawkish factions within Tehran. Israeli Prime Minister Benjamin Netanyahu is inching his country toward an intervention in Lebanon predicated on stopping weapons trafficking sponsored by Iran via Syria. That could be the spark that sets off a chain of military responses from the eastern Mediterranean all the way to Afghanistan. Unfortunately, there are many other flashpoints lying in wait as well. In this scenario, exemptions for Chabahar will be irrelevant. A deteriorating security environment and Iranian responses will likely kill trade. Tehran will be forced to do whatever it can to inflame the fighting in Afghanistan to maximize the U.S. resources and manpower spent there. NATO Secretary General Jens Stoltenberg has stated NATO’s intent to say in Afghanistan despite security forces’ high losses. NATO member states would have to send considerably more manpower to fight, and the United States would bear the brunt of that. Uzbekistan would similarly see its attempts to deepen its economic engagement with the Indian Ocean go up in smoke. Instead of maneuvering around U.S. policy to increase the number of stakeholders in Central Asia by opening up trade routes, Tashkent will face a worsening war on its border. Diplomatic engagement won’t be enough. It will have to start looking at spillover violence, particularly as border control with Tajikistan and Turkmenistan – both economically and politically fragile – will create concerns. If such a conflict comes to pass, Washington will undoubtedly funnel money and broker more deals with Uzbekistan as it tries to keep the government in Kabul in power. But the leverage Tashkent will gain is a mixed blessing. Mirziyoyev’s use of southward regional integration will be for naught, and his talks with Washington will concern minimizing the damage done by U.S. policy. Neither Uzbekistan nor Afghanistan benefit from an escalation with Iran, but both are bracing for what comes next. Nicholas Trickett holds an M.A. in Eurasian studies through the European University at St. Petersburg with a focus on energy security and Russian foreign policy. He is an associate scholar at FPRI and Editor-in-Chief of BMB Russia. Uzbekistan in the SpotlightIn Iran Nuclear Talks, 'No Deal' Is Worse Than Status Quo Tehran’s Designs on AfghanistanIran Hedges its Bets in AfghanistanCan U.S. Get out of Afghanistan?